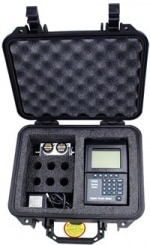 Hard Carrying Case - Digital Power Meters and Antenna Testers The 5000-035 Hard Carrying Case is made of High Impact Plastic and is compatible with the AT Series, Antenna Testers. The units shown are sold separately. * Unbreakable, watertight, dustproof, chemical resistant and corrosion proof. * It is made of Ultra High Impact structural copolymer that makes it extremely strong and durable. * Its exclusive 1/4 (6.4 mm) polymer o-ring and ABS latches seal perfectly and includes An automatic purge valve for quick equalization after changes in atmospheric pressure. * High density foam of the case for total subjection and protection against impact, vibration or shock.